After training hundreds of dogs for other dog owners over the years, Janet Garrett of Janet's Puppy Skool in Haydon Wick is celebrating the achievements of one of her own dogs this week. 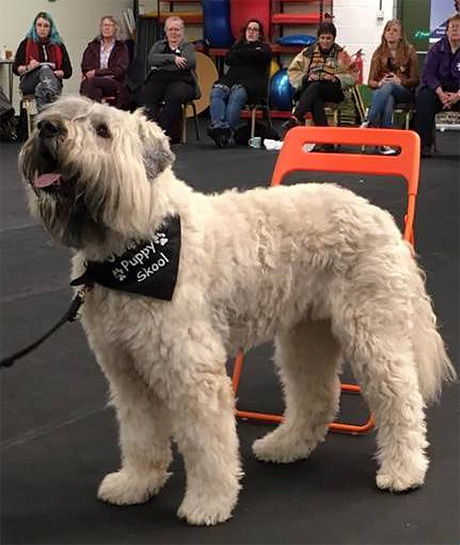 After two weeks of gruelling training, Mack, a Bouvier des Flandres has just been awarded a Trick Champion (TDCH) title - the only dog of his breed to have achieved the accolade. The Trick Dog Champion is the highest tier title, and is awarded to exceptional dogs who can demonstrate outstanding skill in performing a large number of difficult tricks. A delighted Janet Garrett commented "to say that I am exhausted is a complete understatement but I'm so, so thrilled! "TDCH Mack and I look forward to getting back to work when classes start back this week with a huge smile on our faces! After a 2 or 3 week break – watch out America - we’re coming after the American Champion title!"